There's a little snow coming on Friday, but it's hardly an appetizer. A coating to an inch or two is expected, but it's looking weaker than it did a couple days ago. So let's get right to the big one. It’s not your classic snowstorm set-up. We have a strong high to our north, locking in Arctic air, keeping the supply fresh, but the surface low isn’t that strong. Typically with large snowstorms, low pressure will undergo “bombogenesis” and blow up into a powerful Nor’easter. There will be a surface low, but it won't be crazy strong. This is more like a 500 mile long intense warm front and the contrast in temperatures will make for a robust overrunning event. If we didn't have the cold, this really wouldn't be a storm. Light snow moves in Saturday night. It won't get heavy until after midnight. 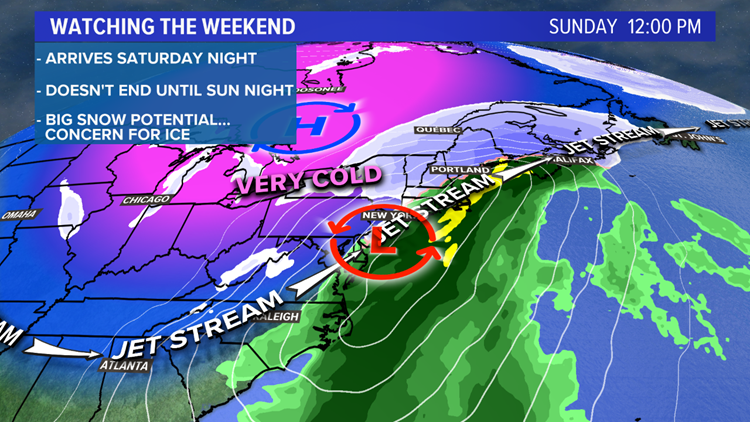 The heaviest snow comes Sunday morning and midday. It's going to be a mess on the roads and travel will be very tough. It may be snowing at the rate of 1 to 3 inches per hour -- that'll cause whiteouts. The "b-word" (blizzard) could even be tossed around. We'll almost certainly hit the visibility criteria in whiteout conditions; the only question is whether the winds will be strong enough, they may not be. Snow continues into the evening, but it should become much lighter. It'll be very cold though, so tough travel will continue. 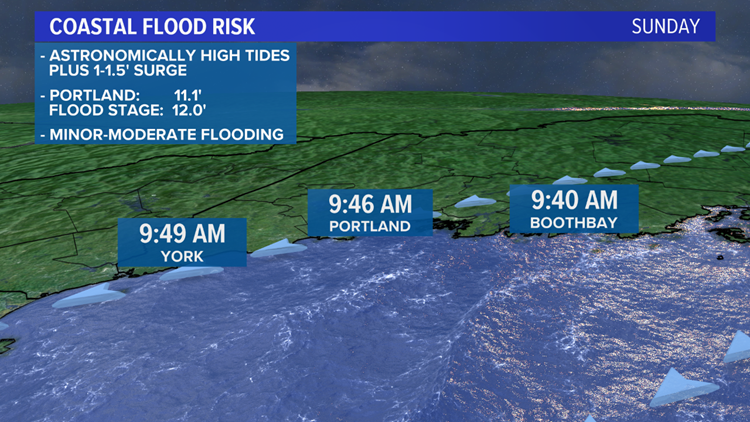 If you're along the coast, don't sleep on the coastal flooding threat. Tides are astronomically high. Fortunately, since this won't be an intense low pressure center, I think we'll avoid major issues. However, the usual spots that flood may experience minor to moderate coastal flooding Sunday morning thanks to the added storm surge. Tides stay up into Monday and Tuesday. The cold behind the storm will be intense, and that's part of the story that can't be ignored. A gusty wind Monday will keep wind chills below zero, with actual air temperatures only in the single digits for most. In total, it's a double-digit snowfall for all. It's tough to get cute with the numbers in a storm like this, because the snow will set up in heavy bands. In general, expect a foot, and you may get two feet. The best chance of hitting two feet will be inland, where it's colder, the snow ratios are higher, and no sleet mixes in. 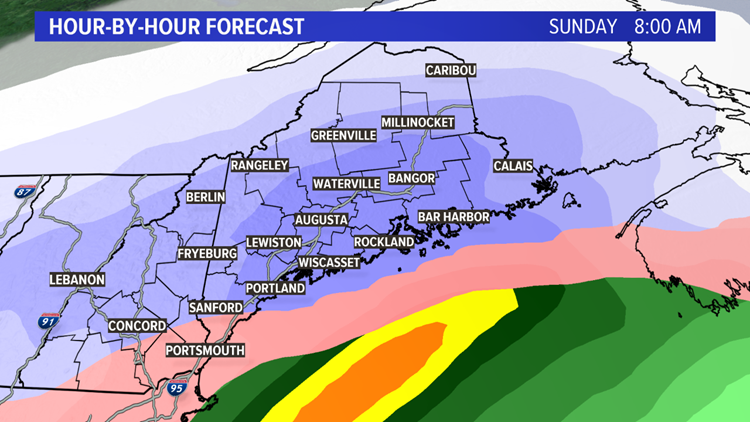 I'm thinking some sleet mixes in near the coast (especially Midcoast and Downeast), but before that happens, at least 10 inches of snow should fall. 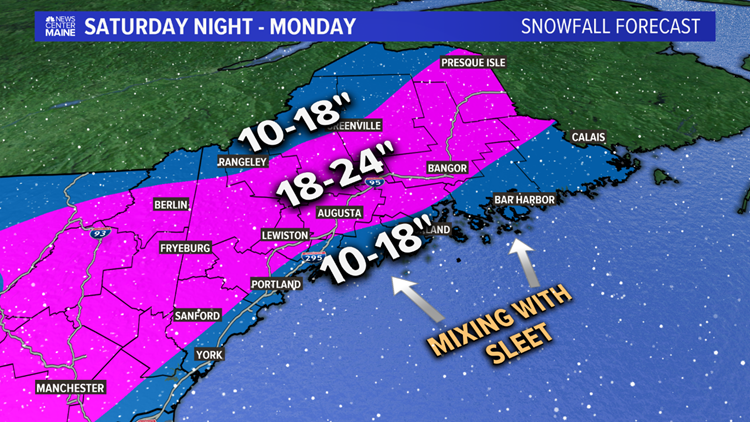 If sleet does not mix in, even the coast is in play for 18 inches or more. This is what we'll be keeping an eye on in future model runs.